The brother of Chilean Father Fernando Karadima called on his brother to ask forgiveness for the hurt inflicted on those he sexually abused. “I would ask him to be humble. Fernando, ask for forgiveness. Not in silence to God or in your prayers. 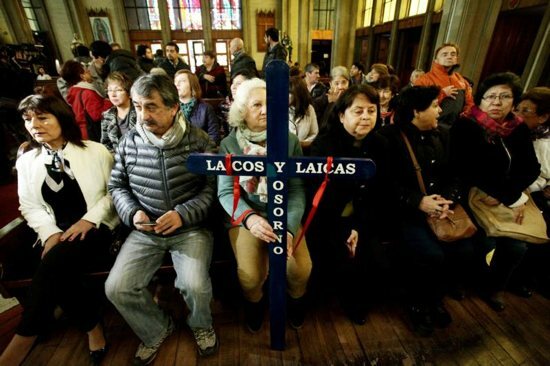 Do it publicly, that people hear that you ask forgiveness for the harm you have done to victims and to everyone,” Oscar Karadima said in an interview with Chilean newspaper La Tercera, published June 17. Oscar Karadima also revealed that he was among the group of priests and laypeople who met with Pope Francis June 2 and spoke to him about the suffering his family endured following the revelation that his brother was found guilty of sexual abuse. “We are the only Karadima family in Chile. I’ve read on social media, ‘The Karadima family are a family of degenerates, a family guilty of covering up, a family of pedophiles,'” he said. Known as an influential and charismatic priest, Father Karadima drew hundreds of young men to the priesthood, and four of his proteges went on to become bishops, including retired Bishop Juan Barros of Osorno. After accusations of sexual abuse came to light in 2010, the Vatican investigated Father Karadima and sentenced him to a life of prayer and penance after he was found guilty of sexual abuse. “The pope stopped me and said, ‘Speak to me about Barros.’ I told him, ‘Your Holiness, Bishop Barros lied. He was my brother’s friend and, in a certain way, you can say he belonged to his ‘iron circle,'” Oscar Karadima recalled. The pope had accepted Bishop Barros’ resignation June 11. Abuse survivors have alleged that when Bishop Barros was still a priest, he witnessed their abuse by his mentor. Karadima recalled tearing up as he recounted his and his family’s pain and that Pope Francis touched his hand and encouraged him. Karadima said he was moved by the pope’s gesture and said it was the first time someone from the Catholic Church recognized his family’s pain. “Neither (Cardinal Riccardo) Ezzati, nor (Cardinal Francisco Javier) Errazuriz, nor anyone acknowledged our pain. That is why what I also ask for — because no one has said it — is justice for my family. The pope was the only one who had words of affection and consolation toward them,” Oscar Karadima said. Archbishop Charles Scicluna of Malta, president of a board of review handling abuse cases within the Congregation for the Doctrine of the Faith, and Father Jordi Bertomeu Farnos, an official of the doctrinal congregation, concluded their June 14-17 visit to the diocese of Osorno with a Mass at the Cathedral of St. Matthew. During the Mass, Archbishop Scicluna, Father Bertomeu and Auxiliary Bishop Jorge Concha Cayuqueo of Santiago, apostolic administrator for the Diocese of Osorno, kneeled before the congregation and asked forgiveness.